Right to keep and bear arms? The topic of firearms control and gun violence is one to approach with caution, given one, the fatalities involved, and two, that in the USA particularly, it can often stir strong debate and emotion on either side. 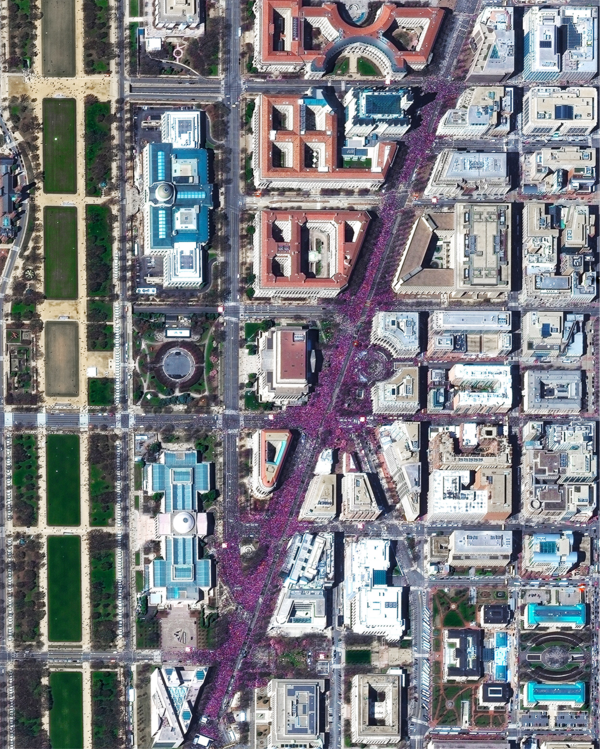 However, following (another) mass shooting at Marjory Stoneman Douglas High School in Florida and the perhaps unprecedented public demonstrations following this in USA, and around the world, as part of ‘March For Our Lives’ – it is a topic which is hard to ignore. With the aim promoting tougher gun control legislation and raising awareness of gun violence, it has brought the debate about US gun laws back into the public eye again; particularly inspiring that it has been passionately led by survivors from this tragedy, who don’t wish to see this sort of thing happen again. I visited America for the first time at the end of last year, and really enjoyed my time in, an albeit freezing, beautiful Chicago. Many things were new and exciting, other things familiar to someone who has grown up in an Anglophone culture. One thing alien and new to me however, was seeing a ‘No Guns’ sign in the entrance of a shopping centre. Indeed, this is where USA is quite different to many parts of the ‘developed’ world, having 42% of the world’s civilian owned guns (see above infographic). Nonetheless, there are political and historical reasons for this, which is why gun control can be such an emotive issue. The 2nd Amendment to the US Constitution protects the right to keep and bear arms, as part of a well regulated militia, and this is a product of the time it decreed – the era of the American War of Independence, where protecting the new nation, the breakaway Thirteen Colonies, and oneself was the motivator. The aim of this article isn’t to persuade anyone one way or the other – I, like you, will probably already have their own opinions on this subject. Instead, I’ve explored this issue using maps to present geographic patterns and evidence to the debate. When exploring this topic, I explored three measures – gun deaths, rankings of firearm checks, and gun ownership. The first map of gun deaths is particularly disturbing, given that this shows more than half of the country have a rate of at least 8.6 deaths by firearms per 100,000 people in a state. To give some perspective, the next highest country in terms of gun homicides, Switzerland, had 7.7 deaths per 1 million population (see more at this great infographic page from Vox). While this map does include self-inflicted gun deaths, it is still a high figure for a developed country. There is a geographic tendency towards lower rates of gun deaths in the Northeastern states like Connecticut and Rhode Island, the higher death rates increase further southwestwards through Kentucky and West Virginia, and then towards the ‘Deep South’, in states like Louisiana (18.9 per 100K), Mississippi (18) and Alabama (16.7). These have the highest gun death rates nationally, along with another traditionally ‘red’ state Alaska (18.8), and Western states such as Wyoming and Montana stand out here too. Setting this as a ‘marker’, there are many geographical similarities and correlation between the gun death rates map, and the next two maps, on background firearm checks and gun ownership (see above). While gun ownership is generally high across the US nationwide, the same tendencies can be noted. There is a trend lower gun ownership in the Northeastern states, particularly Rhode Island and Massachusetts, where as higher ownership, of generally 51% and over in Alaska, ‘Deep South’ and Western states. There is a caveat to these patterns – gun ownership, in rural areas/states particularly, may be attributed to higher participation in hunting or other activities (as indeed any area). One must also factor in the ownership of guns reasoned by fears of neighbourhood safety, whether they would use them actively or not. Nonetheless, there is some correlation here. Particularly relevant to this debate is the level of background firearm checks performed by the FBI NICS, where rankings have been used to measure and compare state by state effectiveness in regulation of firearms. 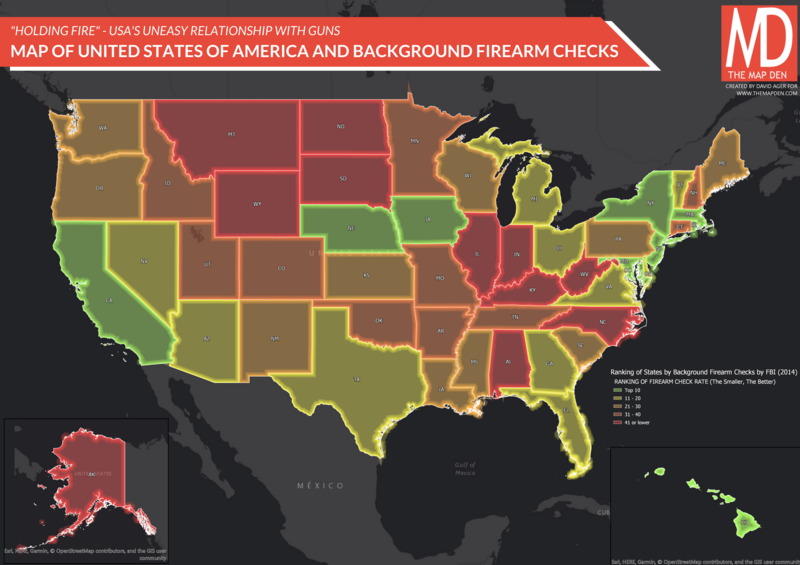 There are some exceptions (like Nebraska and Idaho – there may be other underlying reasons for this), but where background checks are ranked high, e.g. New York State, Massachusetts and Hawaii, gun deaths are generally lower. An arguably stronger correlation can be found when examining where background checks rank lowly, e.g. Alaska, Alabama, Indiana, Montana, Wyoming – gun deaths are relatively higher. Another general reoccuring trend in all the maps is one of poverty. Whether it be higher gun death rates or lower performing background firearm checks, this generally tends to correlate in states where poverty is higher (compare here), such as Mississippi and Louisiana where poverty levels are at 21.19% and 19.9% respectively. Examining the geographical patterns relating gun fatalities and control is just one way that maps are a powerful tool in displaying spatial differences over the United States, or indeed any country. In explaining possible relationships relating to policy, socioeconomics, culture etc, maps can contribute key evidence to key national debates. The spatial analysis seems to suggest a relationship between gun deaths and ownership/background checks – this with other data infographics (see more here) provides further evidence for stronger gun regulations. Indeed the spatial variations in the above maps mask the reality that USA gun mortality is far higher than any developed country, even where rates are low within the US. But maybe the exact numbers don’t matter – one mass shooting or even one shooting is one too many, and that’s why many people across the world have come to march just for that reason.